This post has been updated with a comment from the NC Department of Environmental Quality. Thirteen environmental justice groups and their affiliates allege the state Department of Environmental Quality discriminated against communities of color when it approved permits for the Atlantic Coast Pipeline. The organizations, including Clean Water for North Carolina, the Blue Ridge Environmental Defense League, NC WARN, and many of the groups’ chapters, filed the Title VI civil rights complaint today against DEQ with the Environmental Protection Agency. Title VI complaints can be filed only against entities that receive federal funding. DEQ could not be immediately reached for comment. “The actions allowed by the permit decisions would have a significant and adverse impact on the health and well-being of the members of the Environmental Justice Groups, and on their families, the use and enjoyment of their property, the value of their property and other economic interests. Again, members in communities of color would bear a disproportionate impact. The ACP is a 600-mile natural gas pipeline starting at a fracking operation in West Virginia. The pipeline, co-owned by Dominion Power and Duke Energy, runs through Virginia before entering North Carolina in Northampton County. From, there it continues another 160 miles through eight counties in eastern North Carolina, including American Indian and Black communities. 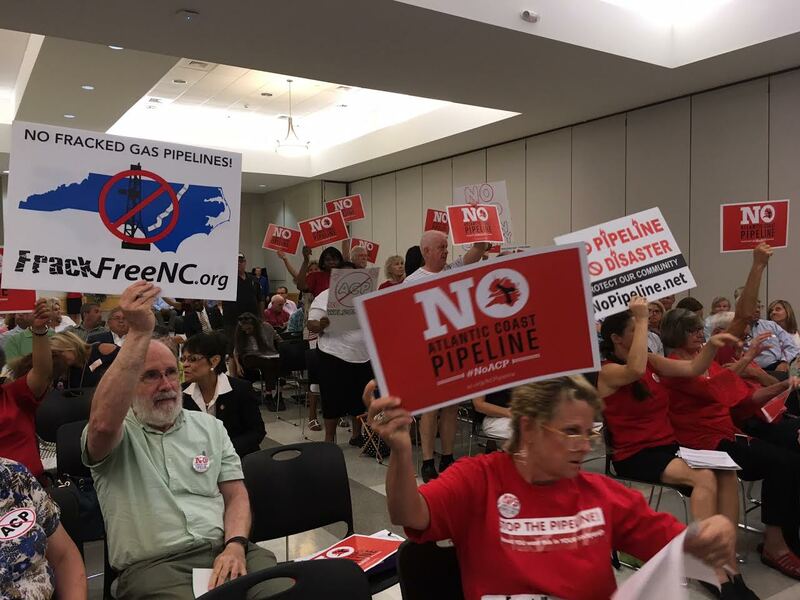 In the complaint, NC WARN attorney John Runkle described the “curious” way federal regulators measured potential ACP impacts on local residents: comparing the incomes of residents close to the pipeline with statewide incomes, while only comparing racial characteristics of residents close to the pipeline with the county in which the project is located. He noted that analysis, conducted by the Federal Energy Regulatory Commission, masked large disproportionate impacts on communities of color, particularly Native American and African-American populations along the route. A study conducted by the Research Triangle Institute found the federal analysis – which was adopted by the state agencies – failed to account for racial disparities. “The counties crossed by proposed ACP route collectively have a significantly higher percentage minority population than the rest of the counties in the state,” RTI concluded. FERC approved a certificate of necessity for the ACP, but DEQ was responsible for issuing water quality, buffer, air, sedimentation and other permits. The filing occurred just two weeks after DEQ Secretary Michael Regan announced the formation of the Environmental Justice and Equity Advisory Board. Its charge is to advise the agency on issues of disproportionate impacts of contamination and polluting industries on communities of color and low-income residents. Well this just goes to say …. we poor people don’t have a chance beating out the rich. I wonder just how close this pipeline runs to those that have influence on our states legislative representatives…. money talks many languages. These people are not about North Carolina people, but more about their selves…. they don’t care where this pipeline goes… as long as it’s nowhere close to them.And this hoopla about all the extensive interviews with landowners and homeowners… anybody in their right mind wouldn’t want a pipeline running thru their backyard!!.. unless they were offered a LARGE sum of money to agree to it…..so go figure.